Irises to Ashes is a book for anyone who has dreamed of following a passion in life. A teenage girl walks the beaches of the Outer Banks, determined to break away from family expectations of early marriage and children. An older woman walks a nearby stretch of beach, withdrawn from most people, her past shrouded in secret. Is it fate that brings them together one hot summer afternoon? Or is it simply a coincidence of timing? Whatever the reason, Maggie Stewart and Amelia Hatcher, the village recluse, are drawn into a relationship that spans fifteen years. Amelia’soffer to send Maggie to Paris to become an apprentice to a famous photographer opens the door for young Maggie to enter a life she dreamed of. Even though her decision strains relations with her family, it is a price she is willing to pay to see the world that beckons her. Maggie’s talent flourishes as she wanders the streets of Paris, snaps photographs of the Swiss Alps, and journeys around Europe. When tragedy widens the rift with her family, she plunges deeply into her work, gaining a reputation for preferring inanimate objects as subjects rather than people. Although Amelia continues to be her touchstone, Maggie avoids entangling relationships, especially romantic ones. She is content with limited friends, wary of commitment, intent on maintaining the independence she holds dear. When a second tragedy penetrates her world, she is given the opportunity to learn about Amelia’s mysterious past. Is she ready to hear the truth or should she walk away without learning what caused Amelia to live in virtual isolation? 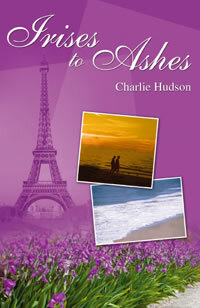 Irises to Ashes is a poignant story, told with insight into human nature and moments of gentle humor. Anyone who has ever dared to pursue a dream will understand Maggie’s passion, and anyone who has ever been haunted by past wrongs will be touched by Amelia’s ultimate search for redemption.